The How-To Gal: Glass Tile Pendants- Perfect Mother's Day Gift! Glass Tile Pendants- Perfect Mother's Day Gift! After my week long hiatus, I'm back! And what a better way to come back than with a fabulous Mother's Day gift idea? 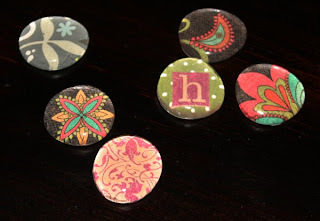 I am also using this project for This is the Year's Mod Podge Mania! Check out Xamin's blog for more awesome ideas! Similar versions of this project are floating around out there, but this version is SUPER easy and inexpensive. 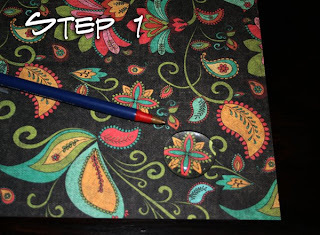 Take your scrapbook paper and trace around stone. Cut traced circle out-making it slightly smaller. 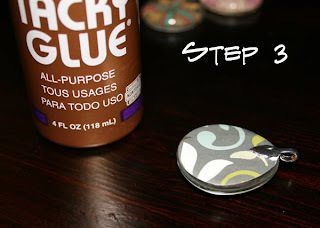 Apply a light layer of mod podge to the back of the stone-it doesn't need much. 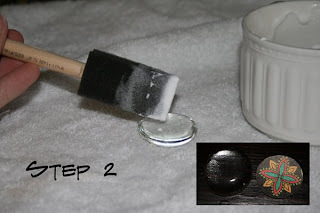 Place the cut circle face down onto the glue and smooth out any creases, wrinkles or bubbles that may form. Then apply another coat of mod modge over the back and edges of the paper to seal it into place. Don't worry about any run over mod podge, it is easily cleaned off later. This part goes so fast you can make several different stones in about 15 minutes while waiting for the others to dry. The possibilities are endless! Glue your bail onto the back and let dry for at least an hour. Wha la! A beautiful necklace that can be interchangeable with different stones. Great project, thanks for sharing. I've seen similar necklaces made from Scrabble tiles, but they are way more labor intensive. I think I like this idea better! Beautiful! Thanks for an easy tutorial! I love these! I've been wanting to try them out forever! I have never seen them made into a pendant...I love this idea! I love, love, love my necklaces. So, hooray for that! I like that you used this for a necklace. I've seen them a lot for magnets, but this puts a little bit of a twist on it! Thanks for sharing! Brilliant!!! Gonna do this for M-Day Brunch instead of place cards! Awesome! This has been on my list of things to learn for the longest time now. I totally am doing some this week. How super cool, and cute!!! Love this! I have attempted the magnets, but wow, too cute! I love this idea. I am going to need to try this one and great tutorial. Very nice!!! YOU ROCK! ModgePodge is just like liquid inspration in a squeeze bottle huh? Welcom my SITSta to SITS, from your friendly, if LATE, Welcomista. Your blog is stunning!!! Thanks for sharing all of these great secrets! This is a great little project! I have tons of fabric scraps. Wonder if well pressed fabric would work? I'll have to try it soon.